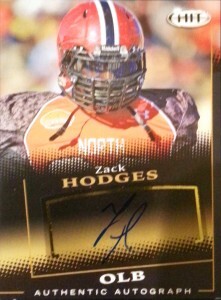 Zack Hodges hopefully will become a real nice rags to riches story. His parents both passed away before his 16th birthday and he battled with bouts of homelessness, but he came through it all to play at Harvard and became a two-time Ivy League Defensive Player of the Year, totaling 26 sacks and 41 tackles for loss over his career at the school. A rangy defensive end, Hodges lined up all over the Harvard defensive alignment. Certainly fitting the mark as a tweener, he could play defensive end, outside linebacker, or even inside with a bit of bulk. Zach was signed as a free agent by the Indianapolis Colts after the 2015 NFL draft, and then later on the Los Angeles Rams. Currently he is a member of the Los Angeles Chargers.